The Musikinstrumenten-Museum in Berlin has 800 historic musical instruments on display. Try visiting when the Mighty Wurlitzer theater organ is played. The remarkable collection of Musical Instruments Museum (Musikinstrumenten-Museum) in Berlin includes around 3,500 European musical instruments from the last five centuries. Many of the displays are as much works of art, as they are musical instruments. Many may be heard in action on the free audio guide, while some are also played during guided tours. The museum has many unique pieces, instruments that belonged to royalty and composers, as well as the largest playable theater organ in Europe. The Musikinstrumenten-Museum in Berlin is one of the largest and most important collections of historical instruments in the world. 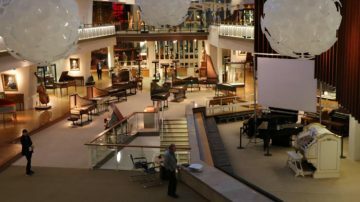 Despite major losses during the Second World War, the collection includes around 3,500 instruments of which more than 800 are on permanent display. The instruments are mostly European instruments from the 16th century to the present. 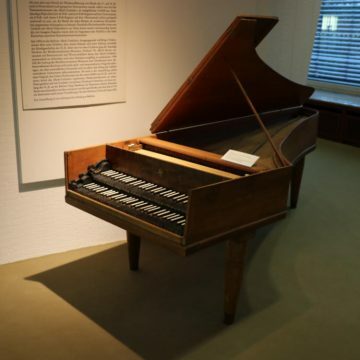 In addition to the highlights and curiosities, the museum is particularly interested in keyboard instruments such as harpsichords, clavichords, and organs, string instruments, wind instruments, automatic instruments, electronic instruments, instruments from the Wiener Klassik and instruments produced in Berlin. Most of the instruments are on display on the main floor in a large open-plan floor space. Further instruments are on an upper gallery where the inside of the Wurlitzer organ chambers may be seen in action. In the basement are a few further instruments and a small café. 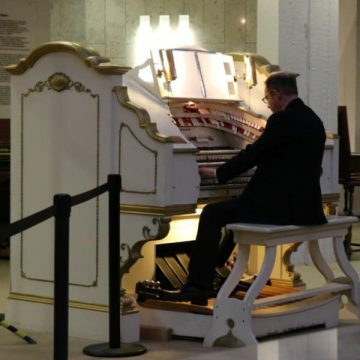 The largest and noisiest exhibit in the museum is the Mighty Wurlitzer – one of the largest theater organs in Europe. It was originally installed in 1929 in the private theater of Werner Ferdinand von Siemens, grandson of the Siemens company founder, but it was confiscated during the war and eventually found its way into the museum. The white, horseshoe-shaped console is on the ground floor of the museum while the instruments are in three rooms on the higher level – windows allow visitors to look into the main chamber, orchestra room and solo rooms to see the instrument at work. Further mechanical and electrical parts such as the wind machine, bellows and relay stations are hidden in the basement. This Wurlitzer has four manuals, 16 ranks, 1228 pipes, 19 effects, and 175 stop buttons. A complex multiplex system allows some manuals to play up to 97 pipes despite each having only 61 keys. The best thing about the Mighty Wurlitzer theater organ in the Musical Instruments Museum is that it is playable and often played with gusto. 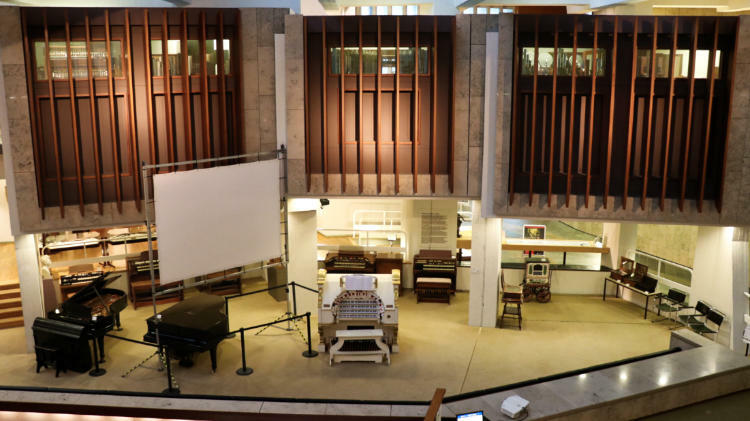 The main event is Saturdays at noon when it is demonstrated in a short organ concerts but it is also played at the end of other guided tours so may often be heard in action on weekday mornings when small school groups tour the museum. Once a month during winter, the Wurlitzer organ may be heard as was originally intended: as an accompaniment to a silent movie. 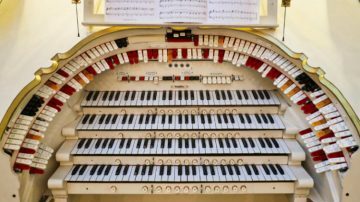 (These organs could replace an orchestra of up to 70!) These Mittwochskino is on Wednesday evenings at 18:00. Admission is €6 and advance reservations (often not essential) are possible at the museum. Among the highlights of the Musikinstrumenten-Museum in Berlin are a variety of harpsichords (cembali). The most famous is the so-called Bach-Cembalo – on the upper floor together with copies used to reproduce the sound. It came from the Bach family although it is not possible to proof that Johann Sebastian actually played it himself. Some of the most valuable and oldest keyboard instruments in the museum are four harpsichords produced by the Ruckers family in Antwerpen in the early 17th century. 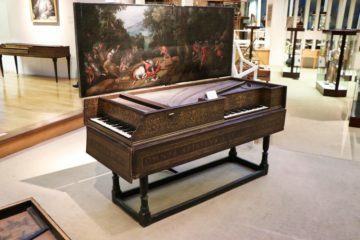 A further traveling harpsichord (Reisecimbalo) belonged to Queen Sophie Charlotte and was used in the court of Frederick the Great. This harpsichord could be folded into three pieces for easier transportation. The museum also has a large variety of interesting wind instruments. Historically the most interesting are probably the collection of early Baroque wind instruments used by the Naumburg town piper ensemble. The museum also has several flutes that belonged to Frederick the Great. 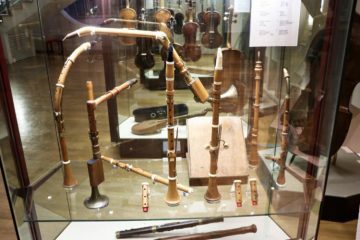 Several further unique pieces are on display including many of very unusual shapes despite being instruments as familiar as the fagot or clarinet. Others are just delightfully oddly shaped. The museum also has a small collection of early electronic musical instruments including a Trautonium (first produced in the late 1920s), a multimonica from the 1940s and early synthesizers. 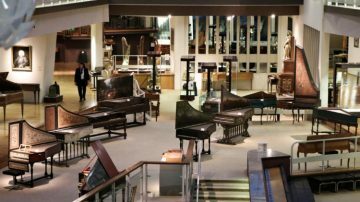 The Musical Instruments Museum in Berlin is open Tuesday to Friday from 9:00 to 17:00 (closing at 20:00 on Thursday) and from 10:00 to 17:00 on weekends. The museum opens an hour earlier than the others in Kulturforum making it a good choice for early risers. The best time to visit the museum is when the Wurlitzer organ is demonstrated – at noon on Saturdays or at the end of guided tours. Musical instruments are also demonstrated during guided tours – good value at only €3 – which are mostly Thursday at 18:00 and Saturday at 11:00. Visitors not part of the tour will still be able to hear the instruments at play, which makes weekday morning also a good choice when small kindergarten and school groups are guided through the museum. Admission to the Musikinstrumenten-Museum in Berlin is €6 for adults and free for visitors under 18. 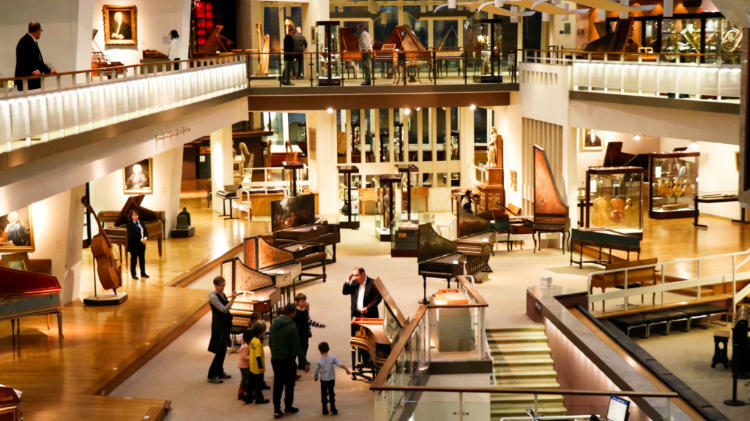 The Musical Instruments Museum is also included in the Kulturforum Ticket of the national museums and admission is free with the excellent value Berlin Museum Pass – 30 museums in three days for €29. The concert hall inside the Musikinstrumenten-Museum is also occasionally used for concerts. Regular concert series include the Alte Musik Live, during which mostly 17th to 19th century music is played on historical instruments, Jour Fixe where younger artists perform, and Jazz in MiM. Tickets are available at the museum ticket counter. The Musikinstrumenten-Museum in Berlin, entrance in Ben-Gurion-Straße, is behind the Berliner Philharmonie across the road from the rear entrance to the Sony Center and thus only a long block from Potsdamer Platz. The closest bus stops are Philharmonie on the very convenient bus 200 or use buses M48 and M85 (stop Kulturforum / Varian-Fry-Straße). All the public transportation options at Potsdamer Platz are only a block away. 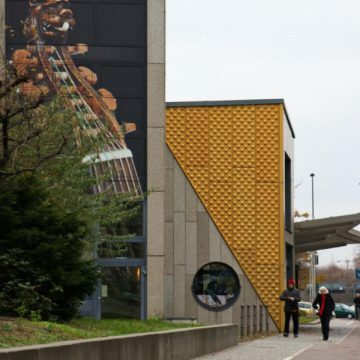 A visit to the Musikinstrumenten-Museum combines well with a visit to the Berliner Philharmonie – daily guided tours and free lunchtime concerts on Tuesdays – and all the other museums in Kulturforum including the Gemäldegalerie and Applied Arts Museum.